Rakhmaninov’s operas - there are three short ones – are not what he is primarily remembered for; they’re seldom performed but they certainly deserve occasional revival. 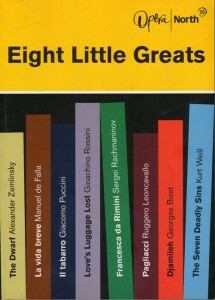 This translation (perhaps the first) of the libretto by Modest Tchaikowsky, was commissioned by Opera North for the 2004 production by David Pountney that was a part of their season of double bills – Eight Little Greats. The three protagonists, Francesca, Paolo and Malatesta were sung by Nina Pavlowski, Jeffrey Lloyd-Roberts and Jonathan Summers. I need no blessing from above. So come, ah come to my embraces!